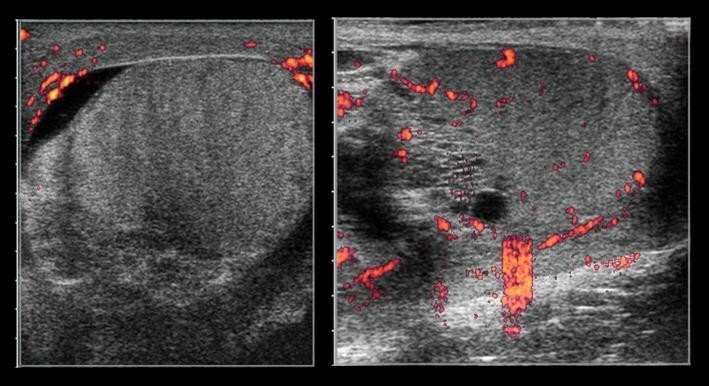 A 59-year-old man presented to the emergency department with a 2-day history of testicular pain and swelling. Testicular pain increased with manipulation and did not respond to pain medications. On physical examination, the right hemiscrotum was inflamed and erythematous with a swollen and tender right testicle and epididymis. Testicular torsion, or rotation of the testes with twisting of the spermatic cord, is a common surgical emergency. Incidence follows a bimodal peak, highest around puberty, with a smaller peak in infancy. Differential diagnoses include scrotal edema, epididymitis, hernia, tumor, varicocele, hydrocele and trauma. This condition warrants strong clinical suspicion, early diagnosis and expeditious surgical management.